Location: .5 mi W of town limits on Rosenoff Road, Ritzville, Adams County, Washington. Cemetery was founded concurrent with the town in 1887, and is presently an active cemetery. 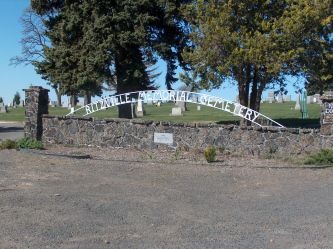 Called the Ritzville Cemetery until the end of the Great Depression, it acquired the "Memorial" in its name in honor of American veterans. The cemetery, seven acres in size, has been surveyed by the Adams County Genealogical Society and complete transcriptions made as recently as 1999. There are 3,523 interments in this cemetery. Click here to view records.